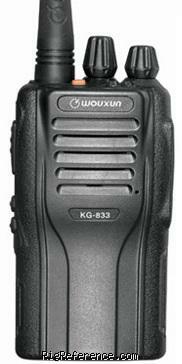 The Wouxun KG-833 is a CE approved PMR446 hand-held. Coming from the same stable as other Wouxun hand-helds, features are also about the same. This rig even has digital FM radio, although the range is unclear. Estimating the value of a rig can be challenging. We collect prices paid by real hams over the years to help you estimate the current value of the Wouxun KG-833. Just bought or sold this model? Let us know what you traded it for and help other ham operators!